Looking to add hardwood flooring to your home? You are not alone. Hardwood flooring has been adding charm and character to homes for hundreds of years and continues to be the preferred floor covering choice of homeowners today. In researching the many hardwoods available on the market, you’ve probably come across terms such as solid, engineered, prefinished, or factory-finished. And you might be wondering which type of hardwood flooring is best for you. To help with your choice, we’ve put together an overview of the differences between solid hardwood flooring vs. engineered hardwood flooring and some of the benefits of each. Basically, when it comes to hardwood flooring there are two main types: solid wood flooring and engineered wood flooring. Both types are offered in the same variety of wood species, widths, and finishes. Both can be stained to a variety of colors. And both can include decorative options such as beveled edges or surface layer techniques such as handscraping or distressing for added character. In fact, if you compare the two side-by-side, looking only at the surface of solid hardwood vs. engineered hardwood, you probably won’t be able to tell the two apart. It’s when you look at the side view, or cross-section, of the individual wood planks that the difference will become clearer. Solid wood flooring is one piece of solid wood – from top to bottom the entire plank is 100% natural wood. Solid hardwood flooring is available in various widths and thicknesses, with the most traditional planks offered in a 3/4” thickness with a tongue and groove fit. Solid wood can be stained and finished at the factory during the manufacturing process – referred to as prefinished or factory-finished – or it can be sanded and finished after it has been installed. Engineered wood flooring is made from several layers of thin wood plies that are laminated together with glue and heat under pressure. The wood plies are layered at 90 degree angles with the grains going in opposite directions, making the finished plank as durable as a solid wood plank, but much more dimensionally stable. The top layer, or wear layer, is the actual wood and is stained and finished at the factory, often with a mixture of aluminum and urethane, which helps make the flooring even more durable and resistant to scratching. Engineered wood planks typically come in 3, 5, 7 or 9 plies and range from 1/4" to 9/16" thick. Plank widths can vary from 2-1/4" to 12" wide. Generally, the thicker the engineered wood planks are, the stronger and more stable the flooring. What wood flooring works best for your home? One of the major differences between solid wood flooring and engineered wood flooring is that solid wood planks are more susceptible to the effects of moisture. Extreme temperature changes, high humidity, and excessive moisture will cause the planks to expand and contract, resulting in gaps between the planks, referred to as cupping. Therefore, solid wood flooring is not recommended in humid areas, sites with extreme temperature changes, or for installations over concrete slabs or in rooms that are below grade level such as basements. In engineered wood flooring, each ply faces the opposite direction. This construction allows the plank to grow and contract with changes in moisture and humidity without the cupping issues found in solid wood flooring. This makes engineered wood flooring the better choice for areas where solid wood is not recommended such as over concrete slabs, in basements, or for homes in highly humid areas such a beach homes. In fact, engineered wood floors can generally be installed in any type of home and in any room – whether above grade, on grade, or below grade. Another major installation difference between the two flooring types is that solid wood flooring must be nailed or stapled to a wood subfloor. 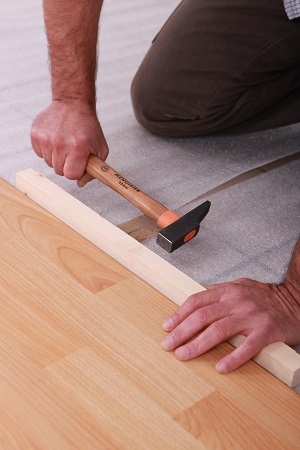 While there are some new glues out there that work with solid hardwood, the traditional nail-down/staple-down method is still the preferred installation method.